The oldest of the Baltic Brothers, and once a Teutonic Knight, Lithuania is a rather gentle-hearted person, but worries constantly. 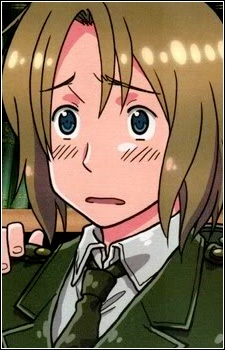 In colored illustrations by Hidekaz Himaruya, he is depicted with brown hair and green eyes, while in the anime, he has dark blue eyes. His best friend is Poland, who affectionately calls him “Liet” (derived from "Lietuva," the Lithuanian word for "Lithuania"). During medieval times, they combined and created the Polish-Lithuanian Commonwealth. They conquered more than half of Europe and had complete control over middle-Europe. Eventually, Russia split them up when he created the Soviet Union, but they’re still good friends nowadays, and were said to have attended rehab together (because of the trauma they endured due to Russia). Russia claims that Lithuania is “his favorite,” which is really just another word for his “victim.” He likes to pick on Lithuania and let him take the heat for all the things that occur. At one time, Lithuania managed to get away from him by acting as a housekeeper in America’s home for about a decade, but soon had to return because of America’s Great Depression. He is a worrier, constantly thinking too much about serious things like life, death, etc. This usually causes him to become very depressed with a stomachache, and more susceptible to be picked on and bullied, which he takes to heart. Perhaps this is why he holds the record of having the highest suicide rate in the world. He is kind towards others and will take good care of them, even though he is somewhat introverted. His hobbies include martial arts, literature, making strange amusement parks, and using different types of condiments in a day (he’s very picky when it comes to taste). It was mentioned that his car is “definitely a second hand car.” Apparently, he has several deep scars embedded on his back. His human name is often rendered as “Taurys Laurinaitis,” but a more accurate spelling would be “Tolys Laurinaitis” because “Tolys” is an actual Lithuanian name, while “Taurys” is not. Even though all of Hetalia's characters are countries, we can still relate to their outlandish personalities and dramatic problems! The show is mostly a comedy, but there are still scenes that can strike a chord. So take a moment to connect to these 10 Sad yet Relatable Moments in Hetalia.